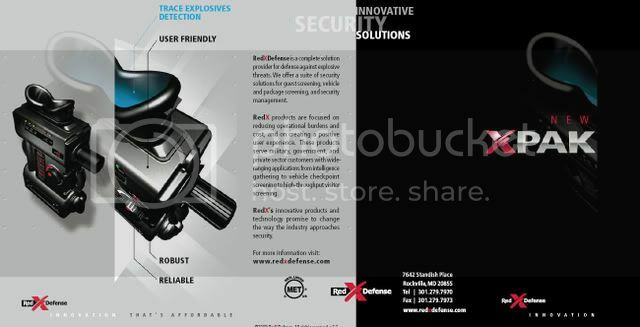 This means more confidence right when you want it most.The XPAK reliably detects trace explosives at a price you can afford. It’s fast and portable, so it’s ready where and when you need it.The sampling baton is optimized to collect from the surfaces youcare about hands, vehicles, packages, and baggage.Our proprietary visual detection method eliminates complex electronics so the XPAK® is rugged even under tough field conditions.Ready at the flip of a switch no warm-up or calibration required. And with one easy step, you have results that are intuitive. Quickly sample large numbers of people at entrances to bases, embassies, buildings, power plants, airports, stadiums, events, and facilities. Randomly screen people and/or their belongings when routine entrance screening is impractical or unnecessary. Screen vehicles at checkpoints or delivery entrances. Screen luggage, briefcases, bags, and other hand-carried items at airports, bus terminals, and other arrival and departure points. Screen letters, packages, and shipping crates arriving at embassies, mailrooms, government facilities, or large shipping facilities. Screen small numbers of people, vehicles, unattended packages, or mailed/shipped items in response to a threat. Information gathering - Gather information about bomb-making activities.